This certified organic catnip toy is made of sturdy heavy-duty fabric to stand up to wild play! The single link toy is packed with 1/2 cup of herb – no fillers. It will become your cat’s favorite! 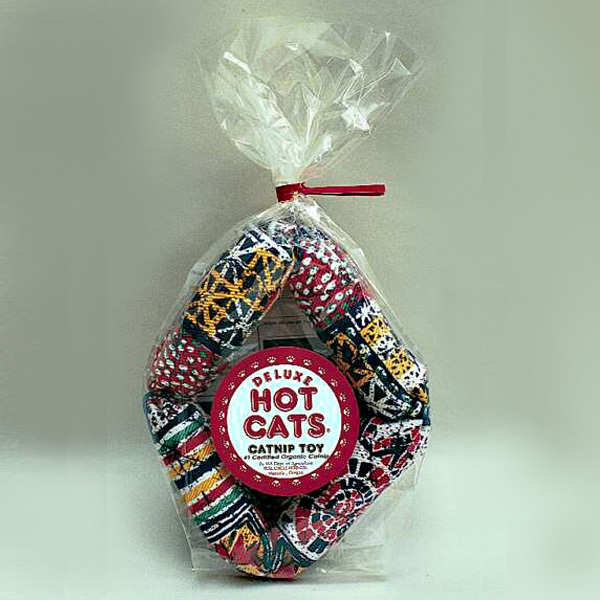 This Single Hot Cat toy is packed with 1/2 cup of certified organic catnip – no fillers. Each toy is carefully sewn of sturdy denim twill in a bright assortment of colors and prints. The single link toy will become your cat’s favorite! Everytime i flew into Eugene, i’d pick these up for my cats. Haven’t been back in years, but if you actually “launder” these, the cats still enjoy them! (i just throw ’em into the washer!) This is MAJOR strong “nip” if you can do that! My cats all-time favorite toys. Got my first one as a gift. My male cat was never much for play, but he loved this one. Now, two years later, it still has enough catnip smell that it gets my new female cat excited! The seem to love the texture of the toy as well, and that it’s long enough they can both chew and kick at it. Buying two more today. 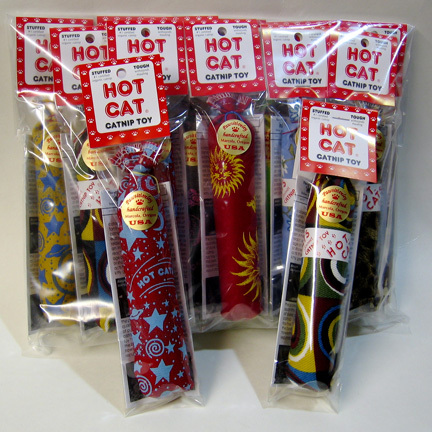 Thanks for sharing your cats’ enthusiasm for Hot Cats – and for the order as well. We’ll get their new toys on the way! Not a single cat I’ve owned liked cat nip. I’ve grown it, bought, and thrown it away. Then a friend gave me a hot cat for my present kitty. Ooh my! It lasted such a long time! He’d forget about it for 2-8 months, find it, then the drooling would begin! It lasted 3+ years. Then she gave him another one. Drool drool drool. Forget about it. Find it. Drool some more! Fabric is very tough, and the nip is definitely super strong – and apparently very delicious! Thanks for sharing your cat’s enthusiasm ! 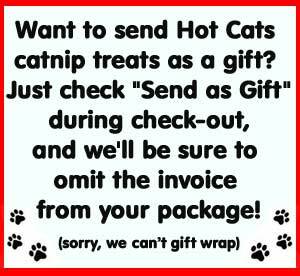 – and thanks for the order for fresh new Hot Cats !